Wepardi Review 2019: Is Wepardi a Good Hosting? Finnish company Wepardi has been providing hosting since 1998. This long-standing company seems safe and secure, but be prepared to pay premium prices for its hosting plans. Finnish firm Wepardi, which was known as Int2000 until 2017, has been providing website hosting since 1998. The name is a portmanteau of the words “Web” and “Leopard” (Leopardi in Finnish) to imply a focus on speed. Wepardi has more than 13,000 customers, and its website is available in Finnish. Most notable is Wepardi’s focus on speed, with its website emphasizing the “fast loading of your web pages.” This claim is based on the company’s content distribution network (CDN) that ensures your content will be served quickly from anywhere in the world. While this vendor also uses SSDs (only on the higher plan) for faster speeds, I don’t really see much more than what many other hosts are doing these days. Neither of the two shared hosting plans comes with an uptime guarantee or SLA, so you’ll need to upgrade to a VPS plan if this is important to you. The base ‘Personal’ package offers fairly good resource levels with 20 GB disk space and 200 GB bandwidth, but it comes with only one domain hosted on HDD storage, so you may well want to go for the higher Business plan if you want to host unlimited domains on SSD. For WordPress users, an optional add-on allows you to outsource the maintenance of your WordPress website to Wepardi for a modest additional fee. And if you’re concerned about keeping your data private, I can tell you that his company is bound by Finnish data protection laws. 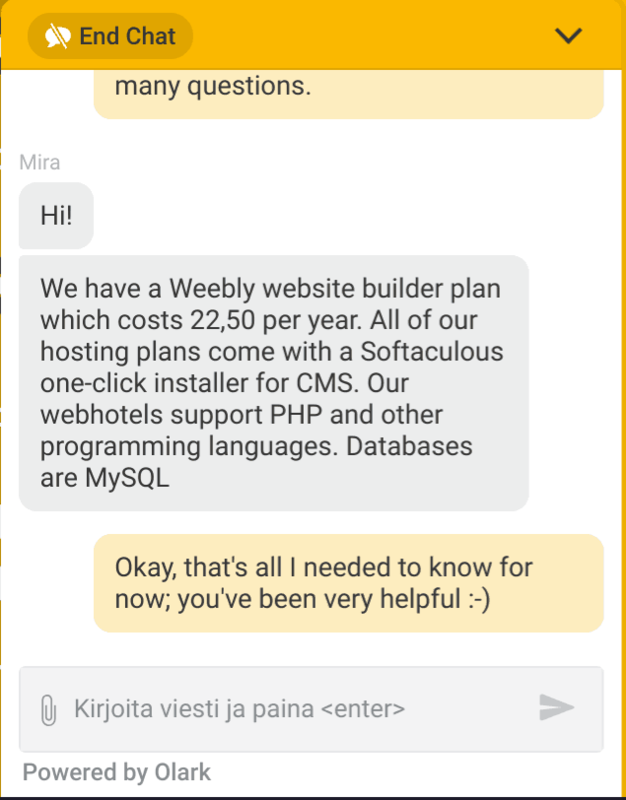 Although not clearly advertised on the Wepardi website (so I confirmed with live chat), you can purchase a Weebly website builder plan, and all hosting plans come with the Softaculous installer for popular CMS programs. At the other end of the expertise spectrum, this provider supports PHP plus other programming languages, and MySQL databases. Wepardi’s prices are very expensive, even compared to other local Finnish companies. So expensive that I had to confirm with live chat that the monthly prices were not actually annual prices! It’s hard to justify the high prices for the few features on offer. Plans can be purchased on one-month or three-month terms, but the price stays the same regardless of the length of commitment. At the checkout, you are required to enter a Finnish ID number, which is okay for local customers but a bit of a problem for an international buyer like me. You can get customer service for free via live chat or email to the operations, sales, or invoice departments, but calling the company comes with a per-minute cost. Existing customers can log into a support portal which may well contain additional resources such as a support ticket system or knowledge base. When I contacted the company, I found that the live chat operator was helpful, warm and efficient. All my questions were answered in excellent English. Given how long this company has been in business, and the fact that Wepardi is one of only 14.8% of Finnish businesses with good credit, you can be assured of a solid host. The SSD-based Business plan has high resource allocations (for a premium price), but the entry-level Personal package comes with fewer features and limited resources. Wondering how Wepardi stacks up against other Web Hosting companies? Enter any other Web Hosting company and we will give you a side-by-side comparison.